Are you interested in diplomacy, trade, security and development? Have you always wanted to know what it takes to be an ambassador? Look no further because His Excellency Kimihiro Ishikane, the Ambassador of Japan to Canada will be coming to IDW to engage in conversation with you. 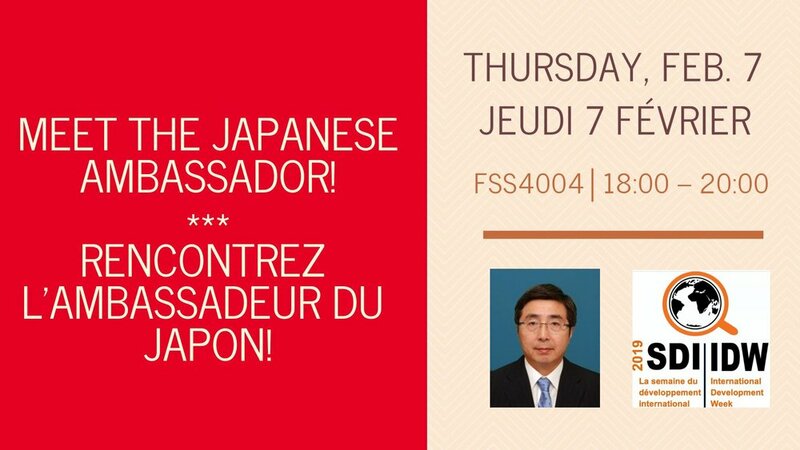 Come learn about His Excellency's career in the foreign service, discuss Japan's international relations and ask questions about becoming a diplomat! Don’t miss out on this prestigious opportunity! Register for the event here: https://goo.gl/forms/xzYq0gahEswCczwx2. This event is a part of International Development Week 2019, a weeklong initiative organized by the International Development Students Association. Accessibility accommodations will be made available upon request, to the best of the ability of the DSA. The DSA acknowledges that this event takes place on unceded and unsurrendered Algonquin territory.